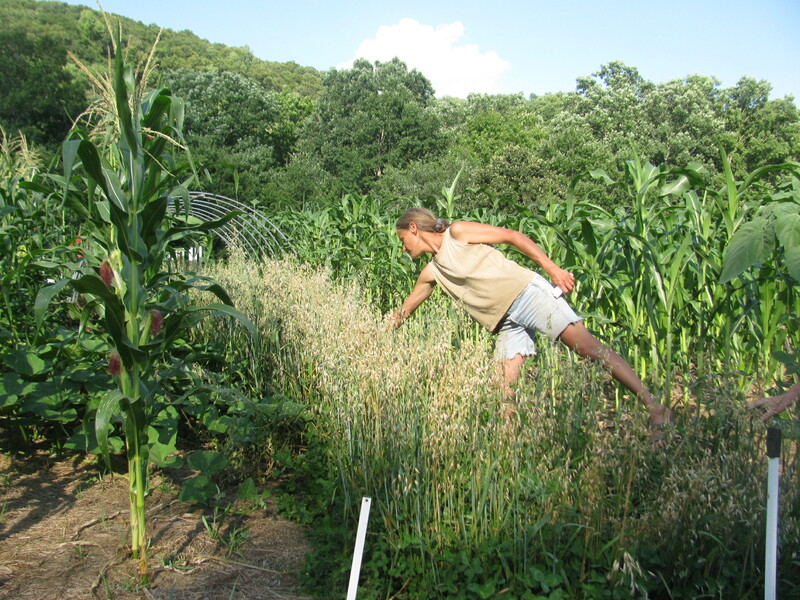 Susana Lein started Salamander Springs Farm in 2001 by clearing 7 acres of degraded ridgetop meadow on 23 acres in the Appalachians south of Berea, Kentucky. Susana was had been raised on a conventional Iowa grain and soybean farm, which was more diverse in the 1960’s and 70’s than most conventional grain and soybean farms are now. Then she had spent 8 years working with Mayan farmers in Guatemala, learning indigenous seed selection & cropping methods, managing a demonstration farm, building appropriate technologies and teaching permaculture practices. Returning to the US, she was determined to live from the land. At Salamander Springs, she built a kitchen of salvaged materials and camped on her land while building a tiny, off-grid passive-solar house and other infrastructure using wood, clay, and straw from the farm. Salamander Springs farm grows and selects our Kentucky Rainbow (Daymon Morgan’s Kentucky Butcher) dent corn seed stock in a 3 sisters system, broadcasts grain and dry bean crops into cover crop residues, and uses mobile poultry paddocks. Susana began living from farm income in 2003. Products, including a wide range of vegetables, fruits, grains, nuts and forest foods, are sold through CSA subscriptions, local farmers’ markets, stores, restaurants, and online through Local Harvest. Salamander Springs Farm still uses no tillage, fertilizers, pesticides or grid power. It now has rich, deep topsoil, which Susana calls its most important resource. The farm offers permaculture apprenticeships and monthly tours, and shows that it’s possible to live well outside the prevailing economic system. Its Flickr and Local Harvest pages have more information, including links to articles by and about Susana.